Click on the "photo" link above to see images described below. I have the original deed from Calvary Cemetery that show 3 lots purchased in 1879 and it still is in my family. I also found a Playbill Collection at the Chicago Public Library that lists my Grandfather, Samuel Bradford, as one of the children in a production at Haverly's Minstrel show. I also have his original "business card" from Haverly's. Samuel was fourteen years old at that time. I have a photo of my Grandmother (Frances Gilhuly Bradford) and her three sisters. I have found a census from 1900 and they were living on State Street then. So my assumption is this is the house on State Street, where the girls lived with their parents, Ellen and John Gilhuly. Charles E. Bradford was my Grandfather's (Samuel Bradford) father. He came from New Hampshire to Chicago. 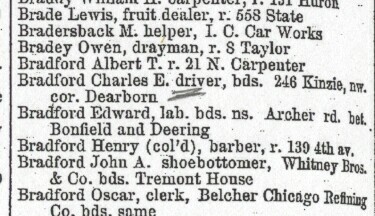 This is one of many Chicago addresses I've found in the Chicago City Directories (1866).